Kathryn Isabel (Evers) Layden, 82, passed away on April 7, 2014, at Schuyler Ridge residential health care facility in Clifton Park, after a short illness. Kay was born in Troy, spent most of her adult life as a resident of Whitehall and lived the last four years at Coburg Village in Rexford, N.Y. Kay was married for 57 years to Edward F. Layden, who predeceased her in April of 2013. Together Kay and Ed had three children and while Ed practiced law, Kay did much of the work of raising their family. Later generations would call her a “stay-at-home Mom,’’ but in fact she stayed at home only some of the time. She spent many hours shuttling her children endlessly to their practices and games, concerts and shows, appointments and meetings. When Kay did stay at home, she was the loving spirit and the steadying force in a bustling household, a rock to her children and her husband. A product of Catholic schools in childhood, Kay was a communicant at Our Lady of Angels Roman Catholic Church in Whitehall and a member of the Catholic Daughters of America. She spent summers with her family at their home on Lake St. Catherine, Vt. and learned to cherish watching the New York Giants with her husband on Sunday afternoons. When her children were grown, she took up golf and enjoyed playing leisurely rounds with her friends at the Skene Valley Country Club. In later years, she loved doting on her five grandchildren, of whom she was immensely proud. Kay is survived by her three children and five grandchildren: Tim and his wife, Janet, of Simsbury, Conn., and their children, Kristen and Kevin; Joe and his wife, Susan, of Saratoga Springs, and their children, Emily and Max; Peg (Layden) Palmiere and her husband, Todd Palmiere, of Latham, and their son, Sam. She is also survived by more than two dozen nieces and nephews. 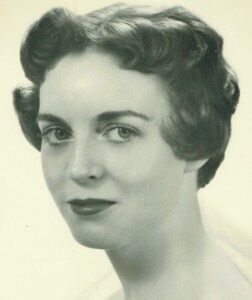 Kay was predeceased, in addition to her husband and parents, by her brother, Joseph F. Evers, Jr. (1923-2000) and her sister, Margaret (Evers) Handy (1927-1989).